The students of Bangladesh University of Professionals (BUP), who were continuing agitation for safe road and punishment to the killer of their fellow Abrar, postponed their protest till March 28. The decision was taken from a meeting between a 10-member students' representatives of BUP and Dhaka North City Corporation Mayor Atiqul Islam and top police officials on Wednesday. The students said that the DNCC mayor assured them of realising their demands. But, a large number of students from different private universities on Wednesday vowed to continue their demonstrations in the city until their demands are met. 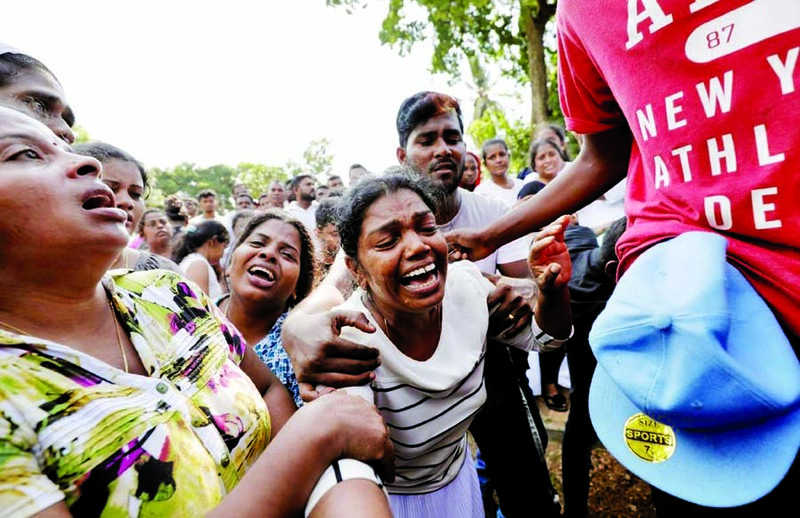 Kawsar Habib, a student from North South University who has been leading the movement, on Wednesday announced that they have decided to stop the protest at 7pm for the day and will start staging demonstrations around 10 am Thursday. "We won't stop the movement though a section has announced to suspend the agitation for seven days," he said. The BUP students' demands include ensuring the highest punishment of the arrested driver within the shortest possible time; withdrawing all buses having no fitness certificates, and construction footbridges, underpasses and speed breakers at all vulnerable points. Later, addressing a press conference at Bashundhara residential area on Wednesday evening, the representative team said, they have given a 7-day ultimatum to the authorities concerned. They threatened to resume their demonstration if the authorities do not take steps within the deadline. Md Wahiduzzaman, a student of Law Department of Bangladesh University of Professionals (BUP), said, "The Mayor has already fulfilled our several demands and we give another seven days for the remaining. That is why we have postponed our street movement till March 28." Earlier in the day the students of the capital's educational institutions, including schools and colleges observed their protest demanding safe road and maximum punishment to the killer driver, who killed BUP student Abrar Ahmed Chowdhury. The protesting students blocked different roads in the capital causing tremendous sufferings to the city commuters. All the students chanted slogans "We want justice, safe road." 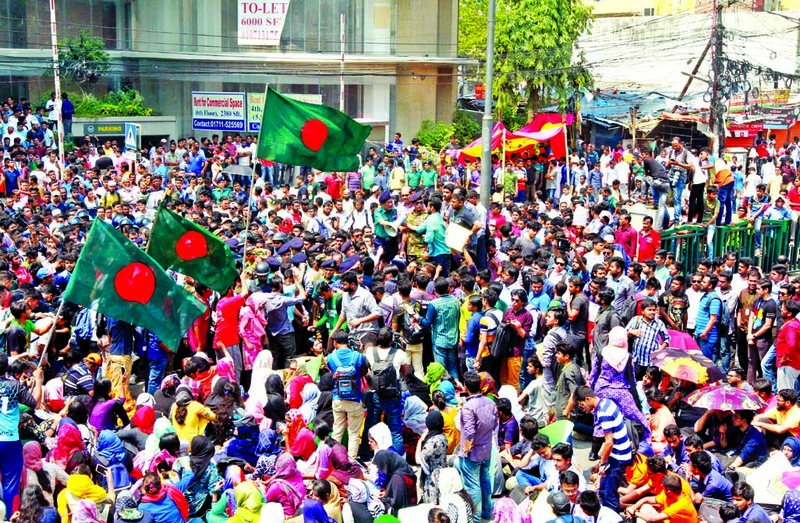 Hundreds of students from BUP, North South University, Independent University, Bangladesh, University of Information Technology and Sciences, East West University, American International University-Bangladesh and Siddeswari Degree College occupied the street on Pragati Sarani in front of Jamuna Future Park at Bashundhara around 9:30am. The students of Dhaka University and Jagannath University also expressed their solidarity and observed sit-in-programme at Shahbag and in front of Jagannath University. The agitating students also blocked Farmgate, Dhanmodi and Uttara. In Basundhara residential area, protesting students shouted slogans, demanding justice for the murder of Abrar Ahmed Chowdhury, an honours first-year student of BUP's International Relations Department, who was run over and killed on the spot by a Suprovat Paribahan bus. 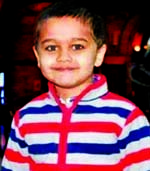 He was hit while crossing the road, using a zebra crossing, in front of Jamuna Future Park, at Kuril, around 7:15am on Tuesday. Students of Viqarunnisa Noon School and College, and Siddeswari Degree College, have expressed their solidarity with the protesting students. One of the protesters, Dr Mostafizur Rahman, Assistant Professor, Disaster and Human Security Management of BUP, told the media "It is difficult for us to accept Abrar's death. He was our first year student. This is but murder. "I have been here since 8am in the morning. The university authority wants students' safety and security. Usually with this kind of protest, some people misuse or politicize it for their own benefit. At that moment, we need to guard agent going wrong with our students." In Mahakhali,Â Students of BRAC University expressed their solidarity with the protesting students demanding safe roads. they gathered in front of the university building and formed human chain with several placards. In Shahbagh, students initially gathered under the Raju Memorial Sculpture, then moved to block the intersection, chanted slogans around 11:45am. Their protest has been peaceful till the filing of this report, and the demonstrators are allowing emergency services vehicles to pass through the blockade. In Dhanmondi 27, students from Daffodil University partially blocked the road demanding safer roads, and justice. They were seen allowing emergency vehicles such as ambulances to pass through, along with some other vehicles. 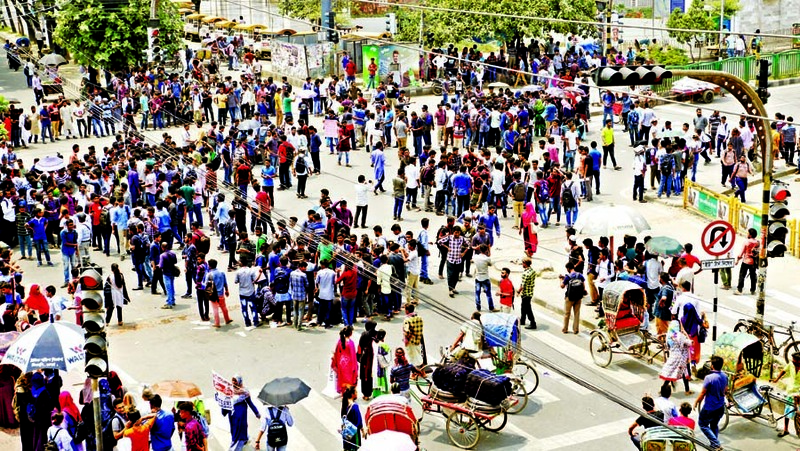 In Farmgate, private university students had also blocked the intersection in the morning, but they dispersed peacefully around 11am, Tejgaon Police Station OC Mazhar Hossain confirmed the reporters. Jagannath University (JNU) students have blocked Dhaka-Mawa Highway pressing their demands for safe roads. The students gathered at Old Dhaka's Raishaheb intersection bringing traffic on Dhaka-Mawa Highway to a standstill on Wednesday morning. They led a rally from the campus, after participating in a human chain demonstration, but were interrupted by the police. Then they took up positions at the intersection. Meanwhile, Dhaka North City Corporation (DNCC) Mayor Atiqul Islam on maintain discipline on the roads. He announced this to students asking for safer roads, after laying the foundation stone of a foot overbridge in front of Jamuna Future Park in Dhaka, on Wednesday. The DNCC mayor said, "Separate committees, comprising students from every educational institution, will be formed. These committees will work in tandem with the traffic police and city corporation personnel to help reestablish discipline on roads. "I will make a serious effort to begin forming these student committees. I am expressing my solidarity with the Student Movement for Safer Roads. We will work together to resolve this grave issue." The Mayor said that a foot overbridge was supposed to be built at the intersection, but construction was delayed for various reasons. "I give my solemn promise that a foot over bridge will be constructed at this intersection against all hurdles. Foot overbridges and underpasses will be built in every crucial area across Dhaka. The Dhaka Metropolitan Police (DMP) and the city corporation will jointly undertake the effort." Discussing the protesting students' 10-point demand, the DNCC mayor said: "I have the list of demands and I will present them to the highest level of the government for consideration. "Discussions have been held with the DMP commissioner to take strict legal action against vehicle owners and drivers if buses stop anywhere that is not a bus stop. We have also held discussions with the transportation owners." The Mayor said that those who are responsible for running vehicles without fitness requirements on Dhaka roads will face stern legal action. Dhaka Metropolitan Police (DMP) Commissioner Asaduzzaman Mia on Wednesday vowed to bring discipline in the city's unruly transport sector. "At any cost, we will restore discipline in the transport sector," he told agitating students at the gates of Bashundhara Residential this morning. "We will not allow transports to ply without fitness certificates," he said.